Established in 1826, the Diocese of Kingston was split to form a new western diocese of the Roman Catholic Church in Upper Canada in 1841. Father Michael Power, who was chosen as the first bishop, selected Toronto as the Episcopal seat. Bishop Power took possession of his See on June 26, 1842 at St. Paul’s Church. Built in 1822 as the first Roman Catholic parish church in Toronto, St. Paul’s was located at the corner of Power Street and Queens Street East. Born in Halifax, Nova Scotia on October 17, 1804, Michael Power undertook his classical and theological studies in Quebec and was ordained in 1827. 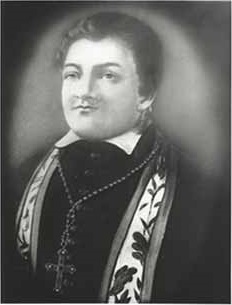 Father Power served as a missionary priest in Quebec before being appointed Vicar General of Montreal in 1839. Upon his consecration in 1842 he became the first English-speaking Bishop to be born in Canada. In 1842, the Diocese of Toronto included approximately 25,000 Catholics served by 19 priests. At that time, the 3,000 parishioners in the City of Toronto were administered at St. Paul’s, the only Catholic church in the municipality. Bishop Power quickly determined Toronto needed a new church building to serve as the Cathedral for the rapidly growing Catholic population. By 1845, he had bought land from Captain John McGill for the Cathedral. Bishop Power paid £1,800 for the property of which £500 came from his own funds and balance from collections in the diocese. The land, which was located on the northern edge of the city and known as McGill Square, was part of Park Lot 7 in Concession 1 from Lake Ontario. There was some criticism initially that the property was too far removed from the settlement centre; however, the quickly expanding city soon encompassed the area. 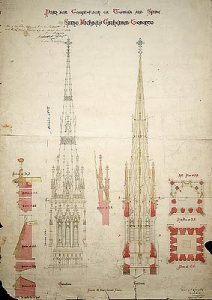 Noted Toronto architect William Thomas was retained to prepare plans for the new church building. John Harper was named the contractor for the project, although in the style of medieval construction projects, components of the work were undertaken by the community labour. Excavation began on April 7, 1845, and a cornerstone laying ceremony was held on May 8. Bishop Power laid the cornerstone with a silver trowel, dedicated the cathedral to St. Michael and placed the diocese under the patronage of the Sacred Heart of Jesus and the Most Pure Heart of Mary. Sealed in the cornerstone were fragments of a stone pillar and pieces of the oak roof from the old Norman York Minster Cathedral in England donated by John Elmsley. Bishop Power did not live to see the completion of the building he had spearheaded. In January 1847, Power had departed on a six month-month trip to Europe to recruit priests for the growing Diocese of Toronto and to raise money for the Cathedral. The trip took him to Ireland where he witnessed the Great Famine (1845-1851) that would result in the emigration of so many Irish to Canada. Prior to his return, Bishop Power sent a pastoral letter read in all Catholic churches in and around Toronto, urging congregations to be prepared for the influx of Irish Famine victims. Between May and October 1847 over 38,000 emigrants arrived in Toronto. With a population of only 20,000, the influx strained local resources. Upon his return to Toronto, Bishop Power administered to the sick and dying, many of who were suffering from typhus. 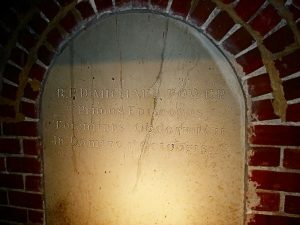 He contracted the fever and died on October 1, 1847. 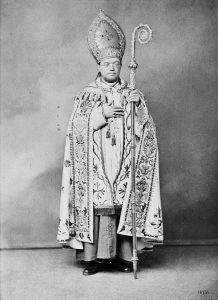 During Bishop Power’s Episcopate, the number of Catholics in the Diocese of Toronto approximately doubled from 25,000 in 1842 to 50,000 to 1847. During his short term, Bishop Power provided energetic leadership to the Catholic community. He is remembered for his contributions to the new Diocese of Toronto including the establishment of its operational framework. The construction of St. Michael’s Cathedral and his compassion to the victims of Irish famine. Although the funeral of Bishop Power was held at St. Paul’s, he was buried in the crypt of the unfinished St. Michael’s Cathedral. The Bishop’s Palace was built at the same time as the Cathedral to serve as the Episcopal Residence, Chancery Office and Cathedral Rectory. Also designed by William Thomas, the Bishop’s Palace was completed and blessed in 1846. The chapel in the rectory was dedicated to St. Ambrose on his feast day in 1846. St. Michael’s College was housed in the building from 1852 to 1856 before relocating to a site beside the University of Toronto. Although the Bishop of Montreal consecrated St. Michael’s Cathedral on September 29, 1848 as the See of Toronto, the building remained vacant. 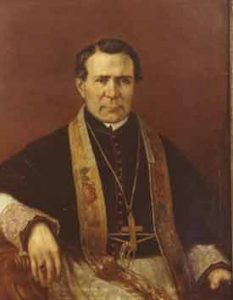 On September 22, 1859, Bishop Armand-François-Marie de Chabron de Charbonnel was installed as the second Bishop of the Diocese of Toronto. Armand de Charbonnel was born in France in 1802 to a noble French family. He was ordained a priest in Paris in 1825 and became a professor before moving to Montreal where he worked until 1847. Upon taking up his post in Toronto, Bishop Charbonnel found the new St. Michael’s Cathedral not only under a burden of debt but also undecorated. Bishop de Charbonnel quickly launched an appeal for funds. He sold lands he owned in France and gave the proceeds as well as all of his personal estate to the Cathedral. William Thomas produced sketches in 1856 for the stain glass windows over the altar. The well-known artist Etienne Thévenot manufactured the windows in France. As well, Bishop de Charbonnel imported the Stations of the Cross from France and has Frenchman Canon Henri S. Philbert undertake the decoration of the vaulted roof. Philbert’s decorative scheme with rosaries, flower, shields, and saints remained until 1937. Bishop de Charbonnel also added chapels in the north and south aisle as well as to the left and right of the sanctuary. During de Charbonnel’s Episcopate, the Diocese of Toronto was reduced in size through the formation of the Diocese of Hamilton and the Diocese of London in 1856. His last pontifical function in Toronto was the consecration of a new high altar in 1860. At de Charbonnel’s request, Pope Pius IX released him from his duties in 1860. He returned to Europe and later entered a friary in France where he dies in 1891. Father Lynch was appointed Coadjutor Bishop of Toronto in 1859 with right of succession. 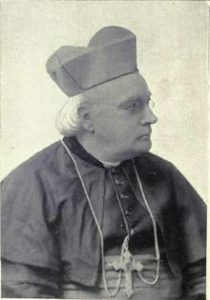 Upon de Charbonnel’s resignation in 1860, Lynch became the third Bishop of Toronto. In 1870, he became the first Archbishop. John Joseph Lynch was born in Ireland in 1816. He studies in Paris and was ordained on June 10, 1843 in Maynooth, Ireland. He served as a missionary priest in Ireland until 1847 when he immigrated to the United States. He established the Seminary of Our Lady of Angels in Niagara Falls, New York and remained there until 1859 when he moved to Toronto to take up his post with the Diocese of Toronto. Under his leadership significant work was undertaken at the Cathedral. Notable activities included the construction of the tower and steeple in 1866, the addition of sacristy and the installation of a fence. Mrs. Charolotte Elmsley donated the first be; for the tower in memory of her late husband. John Elmsley and Archbishop Lynch added a second one 1873. An organ, manufactured by Warren and Son of Toronto, was installed in the gallery in 1880. It replaced the original organ, which has been a gift of John Elmsley. Archbishop Lynch died in 1888 and was buried in the garden of the north of the Cathedral. John Walsh was born in Ireland in 1830 and received his theological training in Ireland and at the Sulpician Seminary in Montreal. Ordained in 1854, he served as a pastor in several parishes before becoming Victor General of the Archdiocese in 1862. Father Walsh was appointed Bishop of Sandwich (London) in 1867 and Archbishop of Toronto 1889. Under the leadership of Archbishop Walsh, further improvements were undertaken at St. Michael’s Cathedral. The addition of several more stained glass windows by the latter part of 19th century had darkened the interior of the Cathedral, therefore clerestory windows were added along the north and south sides of the roof in 1890 in an attempt to provide additional natural light. St. John’s chapel was constructed during this period and dedicated on June 7, 1891. The chapel was used for daily Mass during the winter when it was difficult to heat the large Cathedral. Archbishop Walsh dies on July 20, 1898, and was buried in St. Michael’s Cathedral. By the end of 19th century, the basic configuration of the St. Michael’s Cathedral complex was established with the Cathedral, Bishop’s Palace and St. John’s Chapel. Neighbouring institutions, including Loretta Convent (c1880), St. Michael’s Hospital (1892) and St. Michael’s Parish School (1990), contributed to the formation of distinct Roman Catholic precinct. 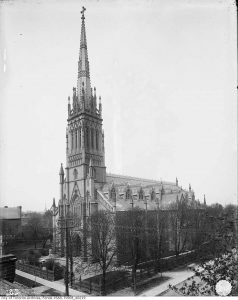 With the replacement of the original 1822 St. Paul’s Church with a new building in 1887-1889, St. Michael’s Cathedral became the oldest Catholic church in the City of Toronto. Within the 20th century, the second Vatican Council (1962-1965) or Vatican II had profound effects on the interior of Roman Catholic churches. Almost every church in the Diocese of Toronto renovated its interior as a result of the directives of the Vatican. St. Michael’s was no exception and the sanctuary underwent significant reorganization at that time. Pope John Paul II visited the Cathedral, Rectory, and St. John’s Chapel in September 1984. St. John’s Chapel in particular, was renovated extensively in advance of the Pope’s visit. St. Michael’s Cathedral endures as the principal church of the largest English-speaking diocese in Canada. The Bishop’s Palace remains in use as the Cathedral Rectory and is recognized as the oldest building in the City of Toronto still in use for its original purpose.